For the last twenty years, shared world book lines have launched or furthered the careers of some of the most recognizable names in fantasy and science fiction, introducing these talented writers to millions of readers around the world. But telling tales set in a franchise means an author must often play by someone else’s rules. What types of stories are allowed, how an epic plot impacts a setting, even whether a beloved character lives or dies—in a shared world, the author does not get the final word on any of these decisions. Editor James Lowder recently sat down with Flames Rising to discuss the creation of this book. You can read his interview here. James Lowder has worked extensively on both sides of the editorial blotter, with both shared world and creator-owned projects. He’s authored several bestselling novels, including Prince of Lies (1993) and Knight of the Black Rose (1991), published short fiction in such anthologies as Truth Until Paradox (1995) and Shadows Over Baker Street (2003), and written comic book scripts for DC, Devil’s Due, Moonstone, and the city of Boston. He’s written hundreds of feature articles and book, film, and game reviews for such diverse magazines as Dragon, Sci-Fi Universe, and The New England Journal of History, and published roleplaying game material for AD&D, Call of Cthulhu, Marvel Super Heroes, and the World of Darkness. As an editor, he’s directed book lines or series for TSR, Green Knight Publishing, and CDS Books, and has helmed a dozen critically acclaimed anthologies, including The Book of All Flesh (2001), Path of the Bold (2004), and Hobby Games: The 100 Best (2007). He’s been a finalist for the International Horror Guild Award and the Stoker Award, and is a multiple Origins Award winner. 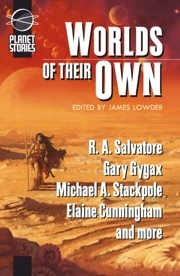 While he cannot claim to have written the book on shared world fiction, he can at least say that he penned the entry on the subject for The Greenwood Encyclopedia of Science Fiction and Fantasy (2005). Sign in to start a discussion about Worlds of Their Own (Trade Paperback)!